As you will know by now, Peter Craddock, the founder of the Havant Orchestras, passed away in October after a long illness. Many of us knew him mostly through his work with the orchestras, and were of course aware of his career as a music teacher, but at his funeral we also learned more about other sides of his life including sport, his interest in butterflies and moths, and his sense of humour! We hope to be able to arrange a future musical event, probably during the 2018-19 season, to celebrate his many and varied contributions to the musical life of the area. One of Peter’s contributions was setting up the bursary scheme for young conductors in memory of Bob Harding, who as president of the society had been discussing such a scheme with Peter. Thirty years later, this scheme continues to provide young conductors with opportunities to work with a symphony orchestra while giving the players the interesting and varied experience of working with new talented young conductors each year. 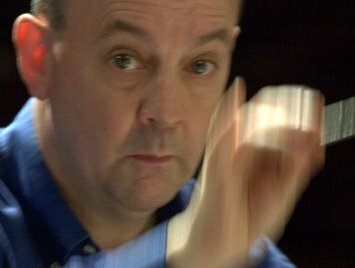 This year we are enjoying working with Richard Miller, nominated by the Royal College of Music, who will be conducting the Butterworth in our concert and has also been helping out by rehearsing other works for this concert and previously for the Hayling concert. 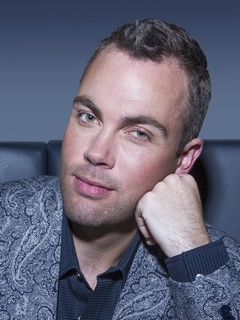 Our star soloist for this concert is unique left-hand pianist Nicholas McCarthy, who in addition to playing Ravel’s left hand concerto will also be giving the pre-concert talk. The concert opens with Elgar’s richly painted overture ‘Cockaigne (In London Town)’ and closes joyfully with Franck’s symphony. Bring lots of friends and neighbours to share the enjoyment of live orchestral music in friendly surroundings at Oaklands School on Saturday! 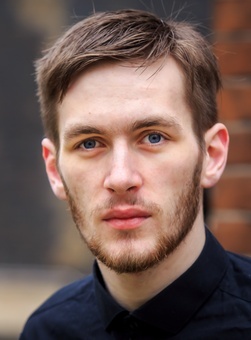 The pre-concert talk will be given by our soloist Nicholas McCarthy. And so to a new season of the Havant Symphony Orchestras but, before I chat about the Symphony Orchestra’s first concert, it would be very remiss of me personally not to mention the recent, and sad, passing of Peter Craddock, the Havant Orchestra's founding father and their conductor for some 50 years. An extraordinary and impressive achievement and I know that many instrumentalists, who played under Peter, and huge numbers of audience members too, owe him a large debt of gratitude. Keeping anything going these days is not a simple task, let alone for 50 years or so! My sympathies go out to to his wife Sandra and family – but Peter’s was clearly a life lived to the full, with so much for which to be very thankful. So – our concert begins with Elgar’s magnificent overture – Cockaigne. Actually – although it is titled an overture it is really a brilliantly picturesque tone-poem, depicting Edwardian London. It musically describes everything from street urchins/cockneys to a peaceful London church. One can really see all the various locations and scenes unfurl, as the music happens. It allows your imagination to paint fabulous pictures of a bygone age. Just think of a BBC period drama and you’re there! It’s a joy to listen to and it is just a entertaining and rewarding to rehearse and perform. There’s just so much going on (but never too much) that every time I conduct it I find something new to intrigue and delight me. Why Cockaigne? – well I’ve turned to Wikipedia for their thoughts: ‘Cockaigne’ was a term used by moralists at that time as a metaphor for gluttony and drunkenness, while Britain adopted the name humorously for London. Well there you are! There will be none of that at our performance, I can assure you! By the way, it’s sub-titled ‘In London Town’. Our Concerto work is something of a rarity and it was written for the left-handed pianist Paul Wittgenstein, who had a large number of works written/commissioned specifically for him. The Concerto is basically in one movement which runs – slow / fast / slow, plus a final flourish. The slow sections are delicious, plus the work features some unusual orchestral instruments, including a solo for the contra bassoon right at the beginning. I know Nicholas McCarthy will do the piece justice. The second half of the concert is taken up entirely by César Franck’s only symphony and, unusually, it is in just three broad movements, not four. The first and last movements include two cracking tunes, whereas the middle one is a sort of minuet featuring a good deal of passages for the harp and an important solo for the cor anglais. More use of an unusual instrument? It goes through numerous keys. The Symphony itself is in the key of D minor but don’t let the minor key put you off – it is a joyous work and will, I hope, leave you wanting more – or at least to listen to other works by Franck. Try his Symphonic Variations for Piano and Orchestra, or Le Chasseur Maudit. Two of George Butterworth’s compositions have the title A Shropshire Lad, one of which is the tone poem you will hear this evening. Most of its musical material comes from Loveliest of Trees, the first movement of his song cycle A Shropshire Lad. Composed between 1910-11, it consists of settings of poems by A. E. Housman, his choice of these often gravely prophetic. Take for instance, the fifth poem which ends: the lads that will die in their glory and never be old . Butterworth would meet his untimely death in 1916 at the age of just 31, one of many musical casualties of WW1. Butterworth’s music is often thrown into the so-called cowpat school of music . This derogatory term is used by those who believe that the music of early-twentieth century British composers, including Vaughan Williams, isn’t worth performing, usually in the context of what European composers were doing within the same period. Butterworth’s inclusion, in my opinion, is rather unfair; he died at a very young age (for a composer, at least) and left little music behind, burning anything he wasn’t satisfied with before going to war. Had he survived, one wonders what direction his compositional style might have gone in. On the other hand, is it possible that death was what established him as a composer worth performing, immortalising his music? Most of his output was unpublished until after his death, perhaps in tribute to him. His contemporaries certainly wouldn’t agree. The conductor, Sir Adrian Boult, a champion of Butterworth’s music who premiered his The Banks of Green Willow, was at the premiere of the tone poem A Shropshire Lad and noted that the performance, of course, made a deep impression. For me, this is beautiful music achieved by very economic means; a snapshot of pre-war Britain that is very much worth hearing. (c/w Introduction and Allegro, Serenade for Strings, Enigma Variations). (c/w Finzi Requiem da Camera, Gurney The Trumpet, Vaughan Williams An Oxford Elegy). (c/w Piano Concerto in G, Valses nobles et sentimentales). 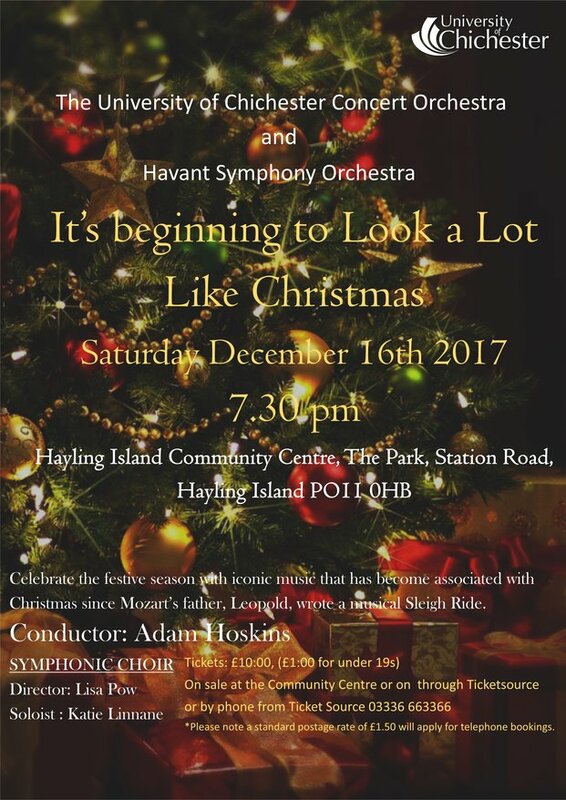 The University of Chichester Concert Orchestra and Symphonic Choir are bringing their event It’s beginning to look a lot like Christmas (see flyer above) to Hayling Island Community Centre on Saturday December 16th 2017 at 7.30pm. Some of our Havant Symphony Orchestra players will be joining in as well and proceeds will go to support Havant Symphony Orchestra in bringing soloists of international standing to the Havant area. The programme includes many favourites such as White Christmas and Leroy Andersen’s Sleigh Ride . 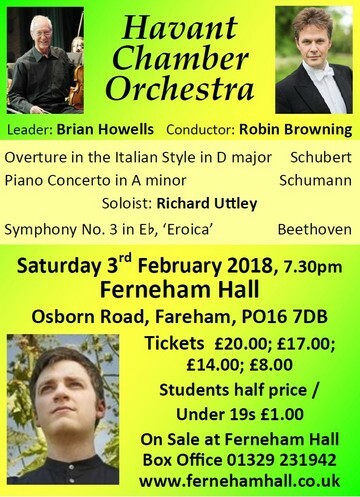 Tickets (£10, or £1 for under 19s) can be obtained online from TicketSource by following the Tickets link by the flyer on the front page of the Havant Orchestras web site, or from the community centre.